In this detail photograph of a Calamigos Equestrian wedding photography album made for the parents of the bride and groom, four beautiful design elements are highlighted. 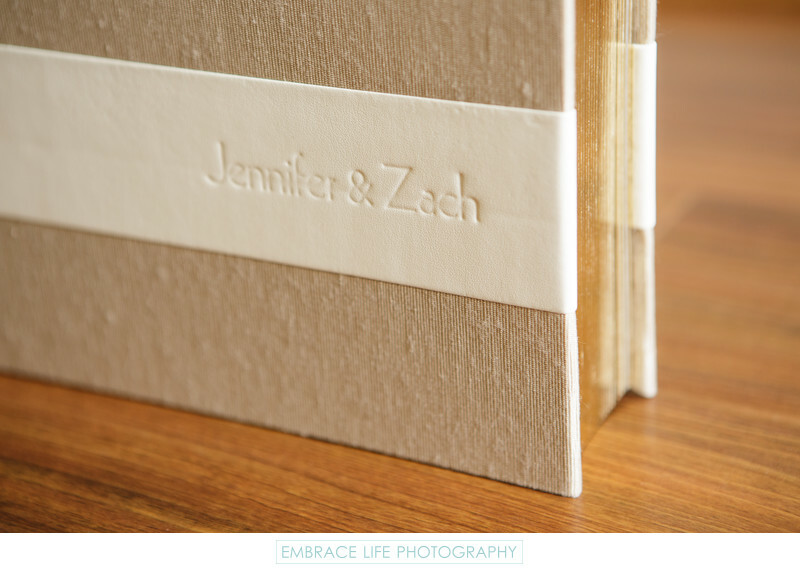 This Hand Crafted Elegant Album is covered in platinum Japanese book cloth, accented by a horizontal stripe of ivory leatherette which is marked by the couple's debossed names, and the pages are gilded in gold foil. The colors on the outside of this wedding photo album are very complimentary, soft and warm, inviting the viewer to open this Calamigos Equestrian wedding album. Inside, the pages are designed with ivory mats and white liners, perfectly completing the presentation of the bride and groom's wedding photographs.